It is bunday again, and the bunnies are mostly sleeping their days away and creating mischief at night. Last night they found a box and was thoroughly entertained for an hour jumping up and down and eating hay off it. The box was a new litterbox on top of their small HOL. We have a bad photo of the fun, although in this photo the buns are asking me what I am doing and not the other way around. In other news it is a long weekend so even if it is Sunday today we have Monday and Tuesday off! And Tuesday is our constitution day so *Kio and I are busy making buntings for the big day. Mimle is enjoying some cuddletime with me. 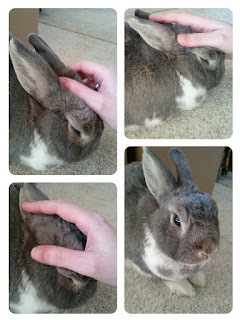 Mimle is an absolute sweetheart and loves her head rubs ^^ Even if I mess up her hair and she must fix it after. I love spending time with a cuddly bun.